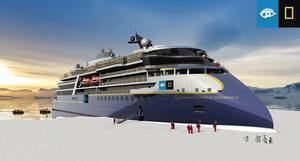 "We are delighted to continue our work with ABB on this second highly innovative polar ship," said Nikolaos G Doulis, Senior Vice President, New Buildings, Lindblad Expeditions. "Passenger safety and comfort are paramount for any cruise operator, so it is critical that our suppliers can demonstrate proven reliability and offer continuous support via ship-shore connectivity, especially as ships venture to more remote locations and ice conditions." "We continuously refine our range of automation, propulsion and digital systems for specific market segments," said Juha Koskela, Managing Director of ABB Marine & Ports. "We are delighted to be working with Lindblad once more to deliver the ship maneuverability and comfort in ice conditions made possible by the Azipod DO solution, but also the full scope of ABB's electric, digital and connected vision offering. ABB's support in real time is especially compelling in polar waters."